Metro Super Wide Shelf Units are 30″ or 36″ deep. Therefore they are deeper than our standard sizes, allowing larger and deeper products to be stored and transported. Because of the larger depth, Metro Super Wide shelves allow you to have one stable system rather than 2 – 18″ units back to back. Therefore, you save money on posts and assembly. These shelves range in size from 30″x36″ to 36″x72″. Super wide units come in chrome, Metroseal and stainless steel. 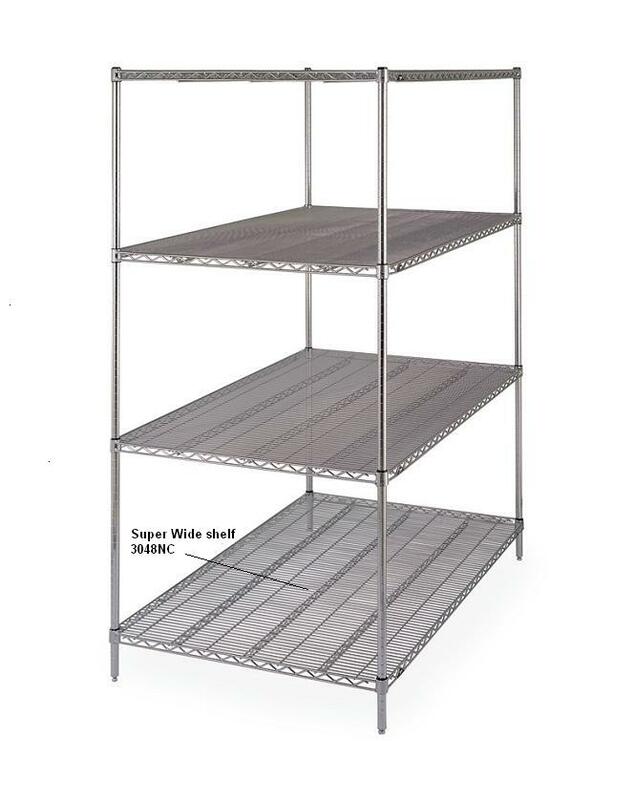 Super Wide shelves use the original Super Erecta posts, allowing for a dynamic storage system. Top Track and qwikTRAK systems are compatible with this product. Besides being easy to assemble, Super Wide units will hold up to 2000#. Each shelf, depending on the size, allows for between 600-800# per shelf evenly distributed load. Metro Super Wide Shelf Units are 30" or 36" deep. Therefore they are deeper than our standard sizes, allowing larger and deeper products to be stored and transported. Because of the larger depth, Metro Super Wide shelves allow you to have one stable system rather than 2 - 18" units back to back. Therefore, you save money on posts and assembly. These shelves range in size from 30"x36" to 36"x72". Super wide units come in chrome, Metroseal and stainless steel. Super Wide shelves use the original Super Erecta posts, allowing for a dynamic storage system. Top Track and qwikTRAK systems are compatible with this product. Besides being easy to assemble, Super Wide units will hold up to 2000#. Each shelf, depending on the size, allows for between 600-800# per shelf evenly distributed load.